Canada wants to let more number of skilled foreign workers to migrate to Canada. The main aim is to get more number of people who can contribute towards to economic development of the country. Canada has a number of visa categories and different types of immigration programmes for this purpose. 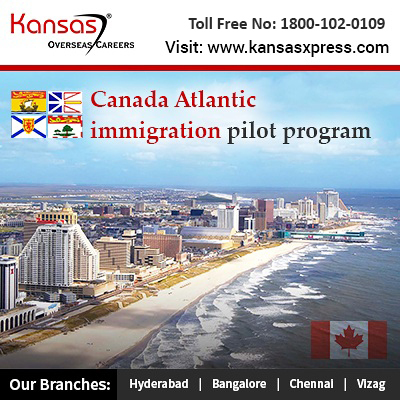 One important visa category is the Canada Atlantic immigration pilot program. This programme is a joint venture between the Canadian government and the four provinces of Canada. These four provinces are New Brunswick, Newfoundland and Labrador, Nova Scotia, Prince Edward Island. With this programme the employers in the Atlantic region can appoint candidates who are not permanent residents or citizens of Canada. If the employer and the aspirant both fulfil all the mandatory requirements then the selected candidate can apply for a permanent resident visa of Canada. This is a part of Atlantic growth strategy. The Atlantic skilled program is a good option for those candidates who cannot make it in the Express Entry system. It is one of the most important parts of skilled workforce-immigration pillar. This programme is an employer driven programme. In most of the immigration programmes the candidates will apply for the Canada immigration. But in this programme the employers have to apply to become designated employers of a province. Then if this designated employer has a job in the designated province then he can hire suitable foreign workers for the same. The Labour market Impact assessment is not needed. But the employer has to prove that he has to hire a foreign worker as there is no proper local worker available for the job. First the job vacancy has to receive endorsement from the province. Only after the endorsement the applicant can apply for the PR visa. The procedure is not complicated. The employer does not have to pay any fees to become a designated employer. He only needs to fulfil all the requirements that have been laid down. The employer needs to apply once to become a designated employer of the province. It must be noted that the employers can simply apply to become designated. It is not mandatory that they have to have a candidate for the job before applying to become a designated employer. English and/or French language proficiency. Enough finances to support oneself and his dependents during the stay in Canada. This is for candidates who have experience in management, professional and technical jobs. This is for those candidates who have high school education. It is also mandatory that the candidate completes certain training requirements based on the type of job. Here no work experience is needed. But this stream has specific requirements in education and the candidate needs to fulfil the same. This pilot programme is beneficial for both the employer and candidates who want to get employment in Canada. But this programme has different streams with the specific requirement of each stream. In order to get in-depth details about this programme it is better to Consult Canada visa consultants in Hyderabad. Make sure that you opt for only reputed visa consultants who can give you proper guidance.